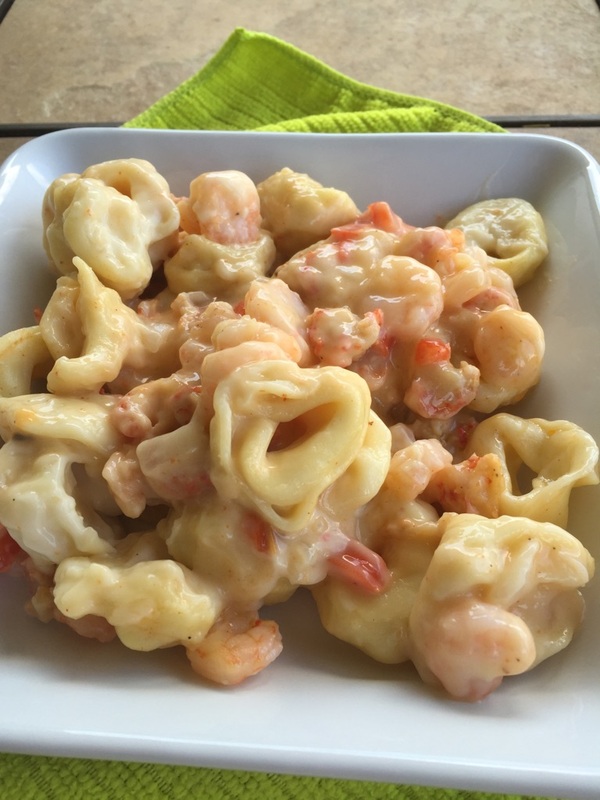 Cajun Tortellini Au Gratin – Mama, Can I Lick the Spoon? Wow! It’s been awhile since I blogged! School has been crazy and our kids’ activities are even crazier! Elizabeth has apparently decided that seventh grade is the year to join EVERYTHING. She’s now in BETA, Mathletes, FCS, the school a Cappella group, yearbook, and the school newspaper. Most of these require that she arrives to school early for meetings. One requires that she stays late for meetings. Yearbook and newspaper require that she attends home football games on Thursdays to take pictures. Christopher plays on the JV and varsity football teams. JV plays on Monday nights. Varsity plays on Friday nights. That’s right. I don’t even like football and some weeks, I am attending THREE games! It’s also still very hot in the evenings – usually still in the 90’s when the games start. So I attend games and sit in the stands. And my sweat is sweating! Seriously. So hot. The kids also both have church activities on Wednesday nights and, of course, on Sundays. Oh! And Christopher is a tournament bass fisherman. He has sponsors and everything! I’m so proud of him – especially since he has secured many of these sponsors on his own. Needless to say, we are exhausted. I have a 12-year old and a 15-year old whose activity calendars rival anyone I know. I still try to cook dinner every night – although, let’s be honest. Some nights, we’re leaving a game at 10:00 and Taco Bell just reaches out its arms and hugs us as we drive by. It would be rude not to order something! I spend most of the weekend trying to catch up on housework. I never do. Seriously. I don’t even remember if there IS a floor in our laundry room. But sometimes, I do have a little time to whip up something delicious. Today was one of those times. I went to the early church service and then came home to make lunch. Michael and Christopher stayed for the second service because Christopher was singing. By the time they got home, I had this yummy-ness in the oven! Boil the tortellini in salted water according to package directions. Drain completely once cooked. In a large skillet, melt the butter and sautee the bell pepper and onion until soft. Sprinkle with a teaspoon of salt and 1/2 teaspoon of pepper. Add the shrimp and crawfish and stir to combine. Add 1-2 teaspoons of Cajun seasoning. 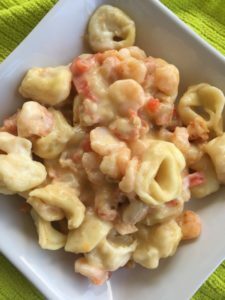 In a large baking dish – at least 13X9 – pour the tortellini and seafood mixture, stirring to combine. Add the queso blanco and stir to incorporate. Cover with foil and bake for 30 minutes. Remove the foil and bake for another 10 minutes. Remove from the oven and stir again. Serve hot. Well Duh #2: Can’t find crawfish? 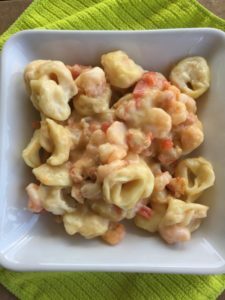 Just add more shrimp! You can even add crab, if you’d like. You just want about 3 pounds of seafood total. Well Duh #3: Don’t do seafood? Use the meat from a couple of rotisserie chickens! Well Duh #4: When you add the seafood to the skillet, you are not trying to cook it through. You’re basically just combining everything. It will cook in the oven. If you cook it too much in the skillet, it will turn rubbery in the oven. This was seriously so good! Michael was about three bites into his bowl and he looked up and asked, “Is there more of this?” I think everybody had seconds except for me and there was still a bunch left over. I squirreled it away and I hope it’s still there so I can take it for lunch tomorrow! 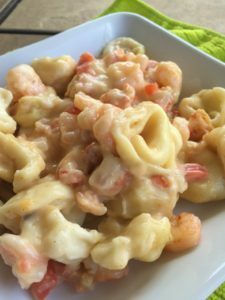 Using white nacho cheese from a can may seem a little unorthodox, but trust me on this one. It works!